Well I can’t say that I remember how many pancakes I hae that morning but I do know that they were the best tasting pancakes I had ever had. 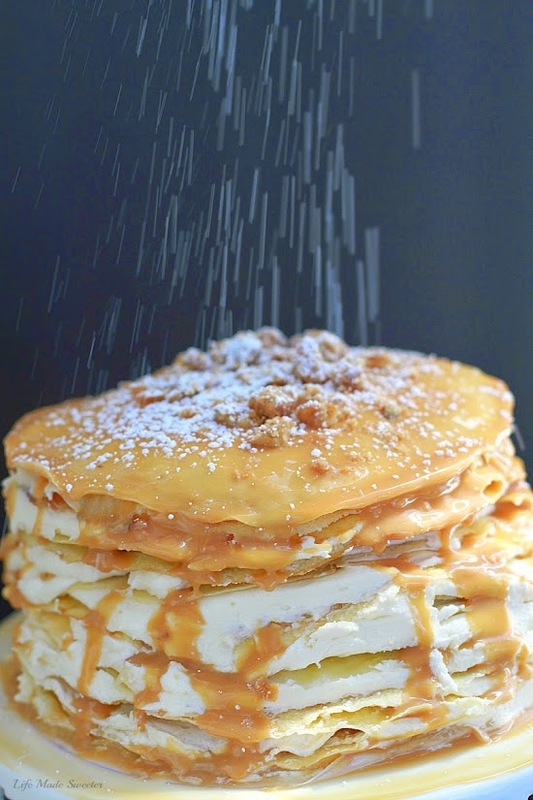 This indulgent maple syrup crepe cake is layered with maple buttercream frosting, maple pecan pralines, and covered with maple white chocolate ganache. 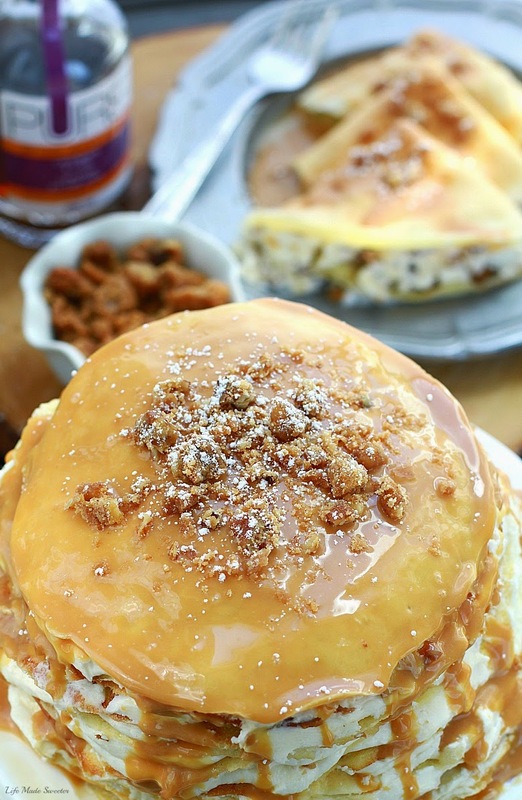 It makes a show stopping dessert that is sure to impress any maple syrup lover. Prepare the crepes: Place all crepe ingredients in a blender. Blend on high speed until completely smooth. Pour the batter into a large bowl with a cover to chill in refrigerator for at least an hour or overnight. 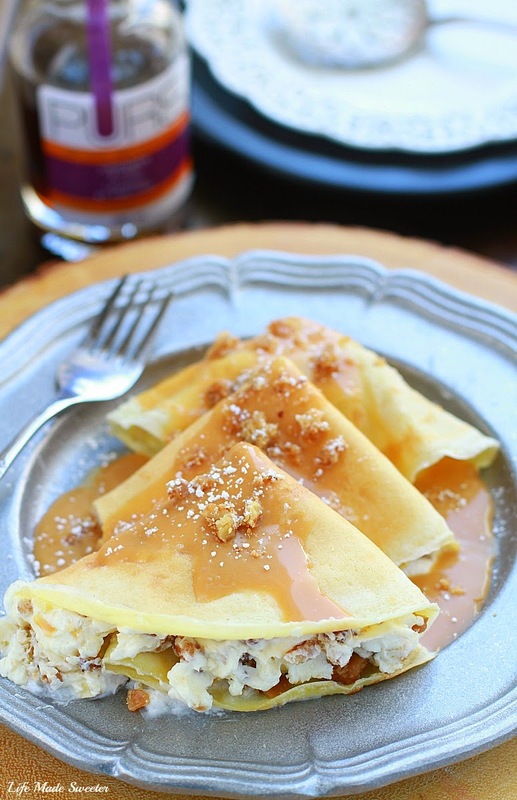 Cook the crepes: Heat a lightly-greased small non-stick skillet over medium heat. Working in batches pour a scant 1/4 cup of batter into the pan and tilt with a circular motion so that the batter coats the pan evenly. Cook the crepe until the edges begin to turn light golden brown and lift away from the sides of the pan, about 1 - 2 minutes for the very first crepe (the rest of the crepes cook faster about 30 seconds to 1 minute). Make the maple frosting: Beat the softened butter and cream cheese together in a large bowl until light and fluffy. Add in the maple syrup and beat until well combined. Make the Maple Ganache: Place finely chopped chocolate in small heatproof bowl. In a small sauce pan over low heat, heat cream just to a simmer. Remove from heat and immediately pour the cream over the chopped chocolate and allow to stand for about 10 seconds. Stir the ganache until smooth. If all the white chocolate has not melted then place the bowl in the microwave and heat for 30 seconds. Using the same saucepan, melt butter over medium low heat. Combine syrup, and brown sugar. Bring to a boil over medium heat and allow to thicken for 1-2 minutes. Pour into white chocolate mixture and whisk until smooth. Allow the ganache to cool until it reaches the desired consistency. To assemble: Place one crepe down on a plate. Drop 1 1/2 - 2 tablespoons of the maple frosting on top. 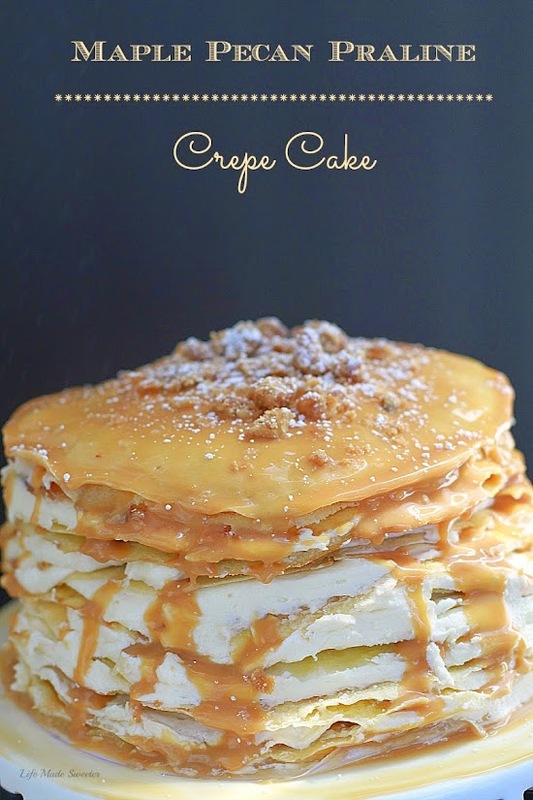 Use an off-set spatula to spread the frosting out over the whole crepe in a thin layer. Gently place another crepe on top. 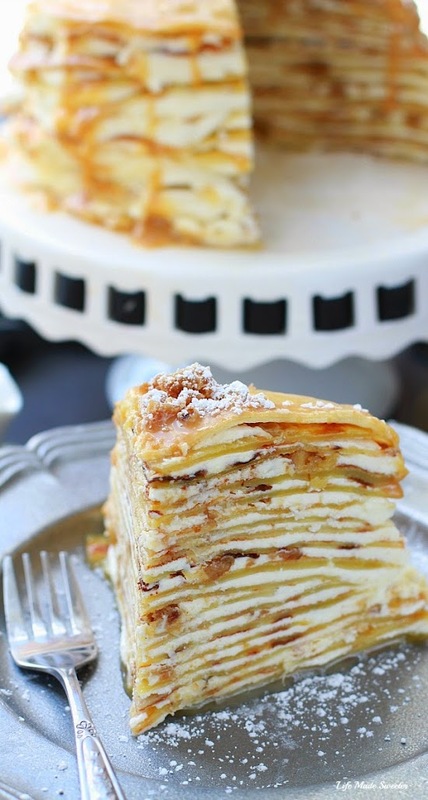 Drop another 2 tablespoons of the frosting and this time, sprinkle with 1-2 teaspoons of the chopped maple pecan pralines and place another crepe on top, gently pressing to adhere the crepes together. Repeat these steps until you get to the last crepe. Top with ganache: Pour the maple ganache over the top of the cake and sprinkle with more of the maple pecan pralines. Refrigerate for an hour or overnight to allow cake to set.